I recently got the chance to talk to Vanessa Marano, who stars as Bay Kennish on Switched at Birth, about the current season of hit ABC Family drama (Mondays at 8 p.m.) I really liked what Marano, who I’ve watched grow up on Without a Trace and Gilmore Girls, had to say about her career, her show and Bay and Emmett. I think you will too. TV Gal: I like that Bay hasn’t gotten back together with Emmett after he slept with Toby’s girlfriend. But Emmett is obviously so apologetic and devastated and he drew a beautiful mural for her. How do you feel about Bay and Emmett? Marano: I’m definitely one of the few people who thinks they shouldn’t get back together. That was really awful. I’m from a belief that if someone betrays you in that way, you don’t give them another chance. It’s incredibly disrespectful. But I think what this season does teach, which I think is super important, is that you can still forgive somebody. You don’t need to necessarily to have them in your life in the same way or feel the same way about them or be a doormat but you can forgive them. TV Gal: Will they get back together before the season finale on October 22? Marano: I really don’t know. It’s heartbreaking because they were such a cute couple. What I like about our show is that with so many intense, crazy, dramatic things happening, it really is character driven and through that so many real emotions come out and that’s what keeps the story grounded. 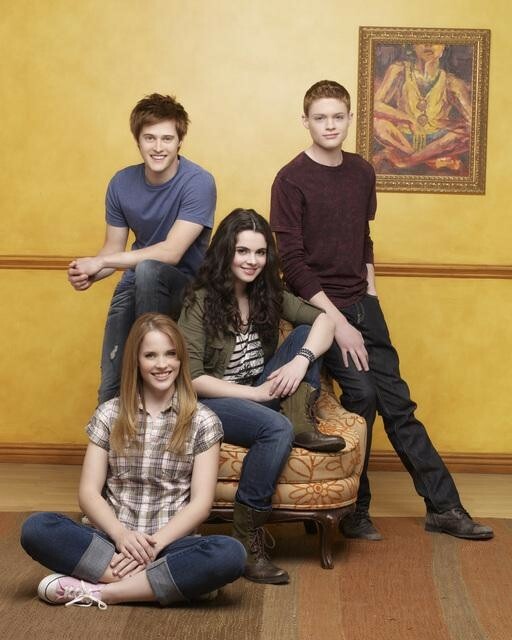 TV Gal: Are you surprised by how popular Switched at Birth has become? I’m so glad that this was the one that was successful. I love everybody I work with. It’s a great show. It’s very interesting and it teaches people sign language and really a well done program. But, more than anything, I’m so proud to go to work with a cast and crew that I adore. TV Gal: You didn’t know sign language before? How challenging is it to act while signing. Really hard. It’s easier to speak it than to understand it. The hardest part about it is I started doing scenes with Sean Berdy [who plays Emmett] and Sean doesn’t talk and I didn’t know when my cue line was. If he put his hands down he could be taking a dramatic pause. And when we started to do fight scenes that was so hard. It’s really hard to elevate your voice. It’s really difficult to fight and scream essentially with yourself. TV Gal: You started acting when you were very young. How did you know this is what you wanted to do? A friend of hers, who was a child actress, said to her, ‘You’re not being supportive of your daughter.’ So she said, ‘Okay. Fine.’ And she looked up agents and there was this one agency that crushes the souls of children and destroys their dreams and she was like, ‘Ah sweet!’ I go in and my mother, who’s an acting teacher, does not help me prepare the dialogue. I go in and read for the agent, she calls my mother in and says, ‘I’ll take her.’ My five-year-old sister walks in and says, ‘Oh I don’t have an agent.’ And the agent says, ‘Oh I’ll take that one too.’ So my sister didn’t even have to beg or audition by the way. I did all the hard work. And now we’re both employed by the Disney Corporation. [Her sister Laura Marano stars in the Disney Channel series Austin & Ally]. TV Gal: Thanks for taking the time to talk to me. I love the show even though I know I’m not in the target demographic. Marano: Anyone who watches is our ideal demographic.